Superstorm Sandy: Remembering Those Who Died : The Two-Way Some of the dead were mothers and fathers. Some of them were young; some were old. Some died as heroes. 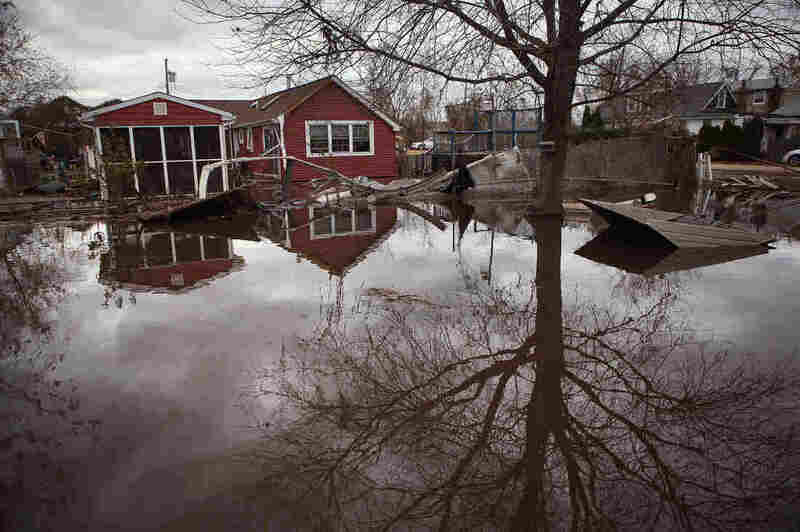 Water continues to flood a neighborhood on Thursday in the Ocean Breeze area of the Staten Island borough of New York City. As New Jersey and New York continue to pick the pieces in the wake of Superstorm Sandy, the death toll has slowly crept up to 97. Some of the dead were mothers and fathers. Some of them were young; some were old. Some of them were police officers who died heroically. The New York Daily news has been trying to keep track of the dead and their biographies. -- Leonard Montalto, 53, of Staten Island, was found dead in his flooded basement. According to the Staten Island Advance, when the flood waters came he sent his daughter off, but he stayed behind to make sure the pumps in his house would work. "Montalto was a mainstay with the United States Postal Service, and was planning a run for president of his local branch of the American Postal Workers Union. Neighbors remembered him as the man who delivered their newspapers. "He was an avid collector of Beanie Babies and old coins, and he saved every document, receipt and record he could. 'He liked to save everything,' recounted his ex-wife. 'He had every receipt since he was in kindergarten... But so well-organized, everything in order, in folders.'" -- Matthew Stahl, 8, of Susquehanna County, Pa., died when he went out to check on his calves. According to the Citizens' Voice, while he was outside, a branch or tree came tumbling down and killed Stahl. The family's pastor Rev. Bob Kadlecik remembered him as a vibrant child, who "loved being outside." "He had a little tree fort that he played in. Huge imagination - just lots of energy," Kadlecik said. -- Herminia St. John, 75, of Manhattan, died after her oxygen machine ran out of power. As DNAinfo reports it, St. John was originally from Panama and she had survived much worse, including a time when a piece of metal, propelled by another storm, gashed her leg. Her final moments were dramatic, with her family calling 911 desperately but to no avail. "Finally, St. John had found a hardship even she couldn't overcome — but she met it with her usual grit. "'She called on me. She gave me a hug, a kiss,' said her daughter, Elsa St. John, 54. "Then her mother asked to be turned toward the window. "'She said her goodbyes, and she went,' Elsa said."